As I have found out for myself, there are no limits to what a mixilating group of short stories can become. A veritable championer of Flash Fiction, Nancy Stohlman embarks upon a strange and irreverent series to situate the reader with death-row volunteers, stewardesses, Avon-lady stalkers, magicians and homunculi just for starters. There are some flashes to be sure but these stories aren’t mere formal reductions or glib plot encapsulations come about by editorial stripping. This is a strange and enticing grouping of vignettes where skeletal structure is ruled by omission or by the vague projections of causality. We traverse momentary realms from the surreal to the absurd to the mythopoetic, often propped up by illogical scaffolding or some labyrinthine state of limbo. There are hints of Kafka, Hoffman, Borges – even more contemporary types like Jonathan Carroll or Angela Carter perhaps. 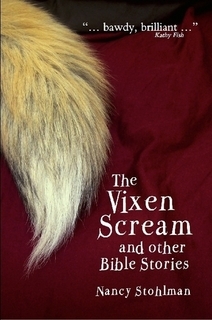 But among these twisted miniatures runs two seams that hint at some totalizing purpose; the first being a set of blasphemous biblical paraphrases and the second offering the on-going presence of the Red Fox. This is an odd and intriguing juxtaposition but the returning fox, although via unconventional treatments, seems to offer the same totemic reverence often found in Native American and Scandinavian myths. So often cast as the trickster, and here infiltrating a world of literary tricks, the presence, although tragic, is a grounding one.